The spirits of music directors present and past are intermingling this week, as the Boston Symphony Orchestra gives the first American performances of Henri Dutilleux's "Le Temps L'Horloge" for soprano and orchestra. There are not a lot of contemporary composers for whom one can imagine both James Levine and Seiji Ozawa sharing a true affinity, but Dutilleux, a 91-year-old French master who writes music at once intensely abstract and sensual, is one of them. 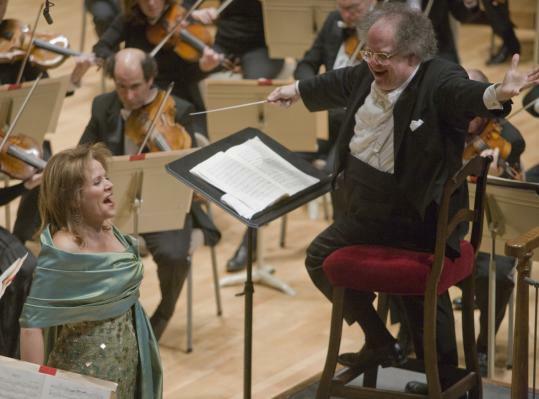 The new work was co-commissioned by the BSO, Ozawa's Saito Kinen Festival in Japan, and the Orchestre National de France; it was written for soprano Renée Fleming, who was on hand last night to sing the American premiere in Symphony Hall. Unlike Elliott Carter, a fellow French-speaking nonagenarian, Dutilleux's body of work has expanded very slowly in recent years, but he makes every piece count. The newest composition, settings of poetry by Jean Tardieu and Robert Desnos, is a small, elegant gem of a piece. Its three short songs pass by like an extended blink of the eye, but they are brilliantly orchestrated, full of extremely subtle colors, realized with a remarkably fine ear for timbre. Instruments that rarely visit the modern orchestra, such as the harpsichord and the accordion, play prominent roles here, but no gesture is exaggerated and not one note is wasted. The work's title comes from that of the first poem, by Tardieu, which translates as "Time and the Clock," a reference to the two types of time, the one that "shows itself" as we watch the minutes tick by, and the one "passing among us noiselessly/ Like a thief in the night." The final song is a setting of Desnos's "Le Dernier Poème," full of shadows of shadows. Dutilleux hopes to set one more poem by Baudelaire to fill out the cycle. The vocal writing too is subtle and evocative without being mannered. Fleming sang with great beauty of tone but with less than ideal nu ance; one wished that her voice responded to a larger portion of the colors in this score. She also seemed to have not yet connected with this music's deeper expressive core. In a way, something similar could be said about her performance of the four orchestrated Duparc songs that followed; her signature tonal glow was present but the singing seemed expressively circumscribed. In the apotheosis of the final song, "Phidylé," the orchestra bloomed but her voice did not. Levine and the BSO sandwiched this old and new French music with more French music: excerpts from Berlioz's "Roméo et Juliette" to begin the program, and Debussy's "La Mer" to conclude it. The orchestra had some spectacular moments in the Debussy but the reading could have used more atmosphere, more mystery, more diaphanous shimmer in the sound. John Ferrillo's eloquent oboe playing in the Berlioz was a particular pleasure.